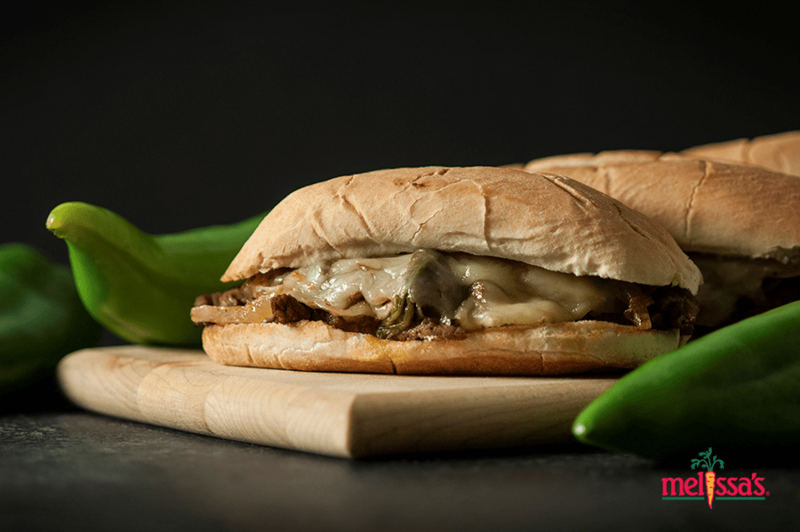 Steak sandwiches are incredibly tasty and adding Hatch Chiles makes them unbelievably good. The best part? This recipe, from Melissa’s Hatch Chile Cookbook, is actually pretty easy to make. Red meat is something you should only have sporadically, so this is a great weekend lunch to make for yourself, your family, or friends as a hearty treat. In a large bowl, mix together the salt, pepper, Hatch Chile powder, onion powder, garlic powder, and thyme. Add the beef strips and toss to coat. Sprinkle the seasoning mixture over the meat. In a skillet over medium-high heat, heat 1.5 tablespoons of the oil until shimmering. Add the beef, saute it to desired doneness, and remove it from the pan and set aside. Add the remaning 1.5 tablespoons of oil to the skillet, and saute the onions and Hatch Chiles until the unions are softened, about 5 minutes. Divide the meat among the bottoms of the 4 rolls, layer on the onions and Hatch Chiles, then top with sliced cheese. Set on a baking sheet and broil to melt the cheese. Cover with tops of rolls and serve. Get more tasty Hatch Chile recipes from Melissa’s Hatch Chile Cookbook, available in stores now. Be sure to share your favorite Hatch Chiles recipes with us in the comments below! Share your Hatch Steak Sandwich photos with us by posting onto our Facebook page or using the hashtag #CookingWithMollies on Instagram or Twitter.